Do it Best Rewards Program is Here! Not only is it FREE to sign up and always will be free to be a Rewards Member, but there are all sorts of benefits for being part of this club. 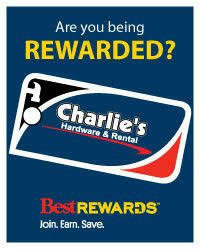 Earn a point for each dollar you spend at Charlie’s Hardware. For every 250 points you earn you will receive a $5 coupon for your next visit. Receive a $5 coupon on during the month of your birthday. Receive coupons for special holidays like Mother’s & Father’s Day. Our top 50 customers will receive additional coupons for paint discounts. Enjoy benefits of earning “Double Points” on in-store specials and special pricing for members only. This is not only a way for us at Charlie’s to say THANK YOU to our loyal customers, but to help you save some of your hard-earned money as well. Stop in and sign up today!